The reason I have time to write so much today is that there is a terrible storm at Rothera today: windy and snowing. None of the research planes can fly, and since that’s what we need to get our work done, we just have to sit and wait. I’m thankful I’m doing this waiting at the base however and not in a tent. So continuing on with snow school. After retrieving Mark, we had to go back down to the base to gather our gear for the overnight portion of our training. 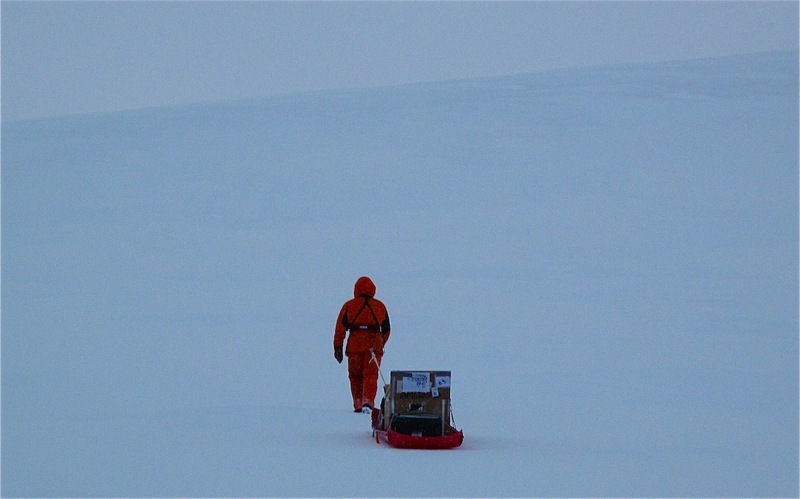 We loaded up our stuff and went about four kilometers away from the base. The four of us got on the back of two skidoos that would take us up to the campsite. The skidoo I was on was also towing a sled with all our sleep gear, which is important to note because on the way up the slope the sled tipped and some of our stuff fell out and starting sliding down the slope. Our poor instructor had to go chase after it because there were dangerous areas on the slope. So we got up there and started to set up two tents that sleep two people. The tents are large heavy tents, not the kind you would backpack with. Anyway, at about this point I realize, “I’m going to have to sleep in a tent with one of these guys.” Another thing to mention is there was no place to go to the bathroom up there, not even the bucket that I will have available when we get to our research site. So I was thinking it’s a very good thing I packed my GoGirl for this overnight trip. However, when I came up with my brilliant GoGirl plan I never factored in a man sitting in the tent next to me. After radio it’s on to the tents and here is where Ben tried to get past the awkward part that one of those guys had to share a tent with the girl. Two of the men were already kind of chummy, so they defaulted to each other, and that left poor Mark with me–Mark who I pulled off the mountain. I can’t really imagine what this kid was thinking, but I was thinking, “I still have to pee.” We got in our tent and set up our sleeping stuff and our stove and all. Then we boiled some water to make our food, which is called “man food.” They call it “man food” to distinguish it from “dog food,” a remnant from when people used to bring dogs down here. The bag of “man food” I had was vegetable casserole and the package read, “Best if used before 08/2006.” Very excited to have dinner, but I still had to pee. To make “man food” you boil water and add it to a bag, seal the bag, and wait a few minutes. I have to admit it wasn’t the worst thing I’ve ever eaten. After dinner Mark said he was going out to go to the bathroom and I then had to tell this 23 year old boy that I have a bottle and a GoGirl and I’m going to take this opportunity to do the same. He says “Okay, I’ll ask you if you are ready before I come back in.” Awkward! I was thankful to have the GoGirl though because the wind was still raging and I didn’t want to go outside and pull my pants down on this large flat expanse where we were camping–nowhere to hide! Camping wasn’t too bad. That lantern kept the tent warm and my sleep gear was pretty good. In the morning it was cold and of course windy and I woke up pretty early and had to, you guessed it, pee again. So then I had to wait until Mark woke up, which seemed like an eternity, and wait for him to go outside again. Thankfully when we are in the field doing our work I have my own tent and can go whenever I want. In the morning we packed up and started back to base. This time not only did our gear flip going down the slope, but the skidoo flipped! Before I knew it I did a flip in the air and landed facing the skidoo. The other guy on the back of the skidoo got his leg hit with the tow bar and he was in some pain. I was just amazed by the acrobatic feat I retrieved from my past to help me avoid getting pinned under the skidoo. Ben felt pretty bad about the whole thing, this poor guy, I can’t believe he has to go though this every time new inexperienced people come to the station. He has incredible patience, I would have lost it! When we got back I found out that Ted, Martin, and I cannot be flown out to our site today. This is not good news because the longer it takes for us to get out it potentially effects how long we will be here. The planes are unable to fly in bad weather. There is a very large storm going on today and it looks like we can’t fly until possibly Saturday! 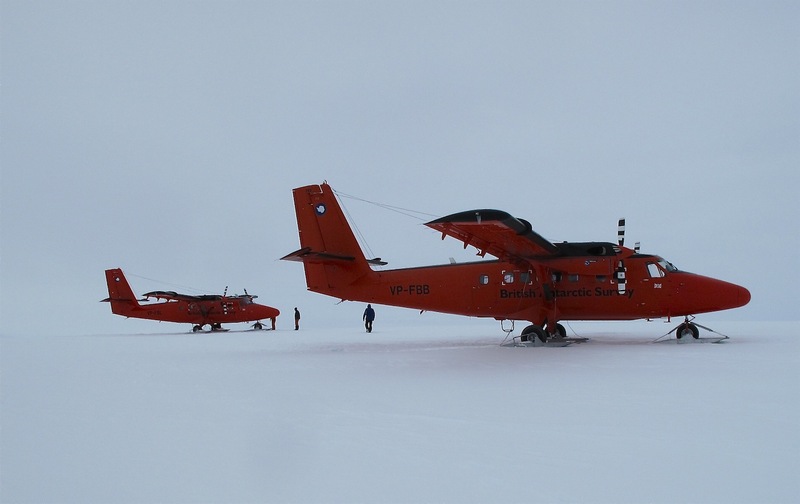 The LARISSA glaciology team flew to its highest-priority glacier site, Flask Glacier, four days ago during a brief spell of clear weather. 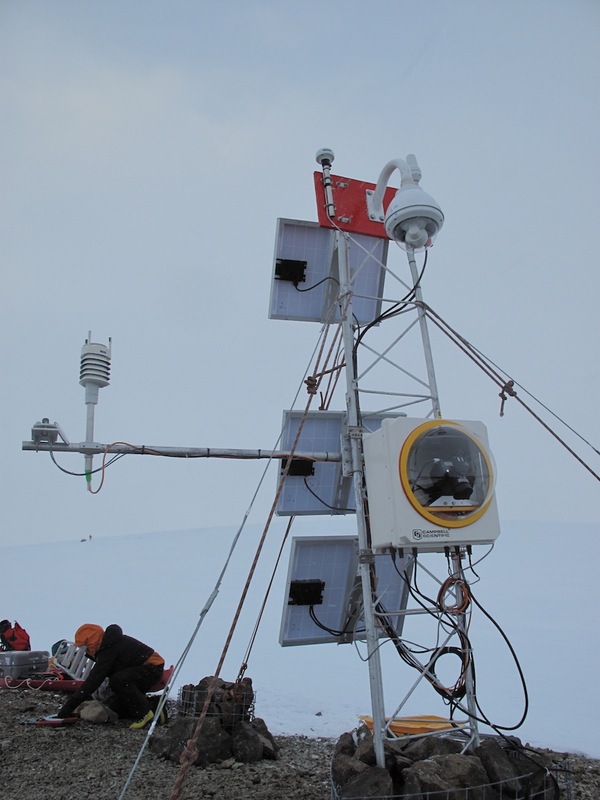 Although the forecast was dicey, the pilot spotted clear sky over our site while flying to the ice core drill camp (Site Beta) earlier in the afternoon. 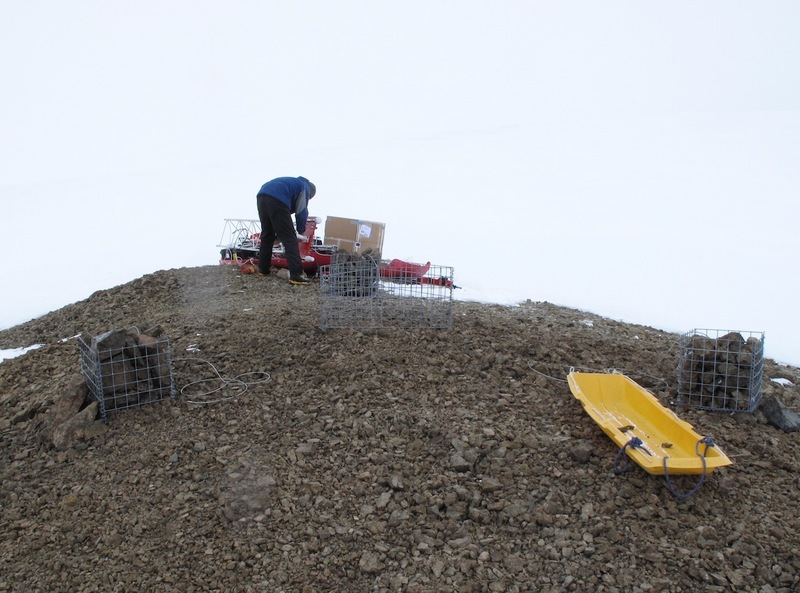 As soon as he arrived back in Rothera, we loaded our camp gear and three of us (Erin, Martin, and Ted) flew out to prepare the camp. 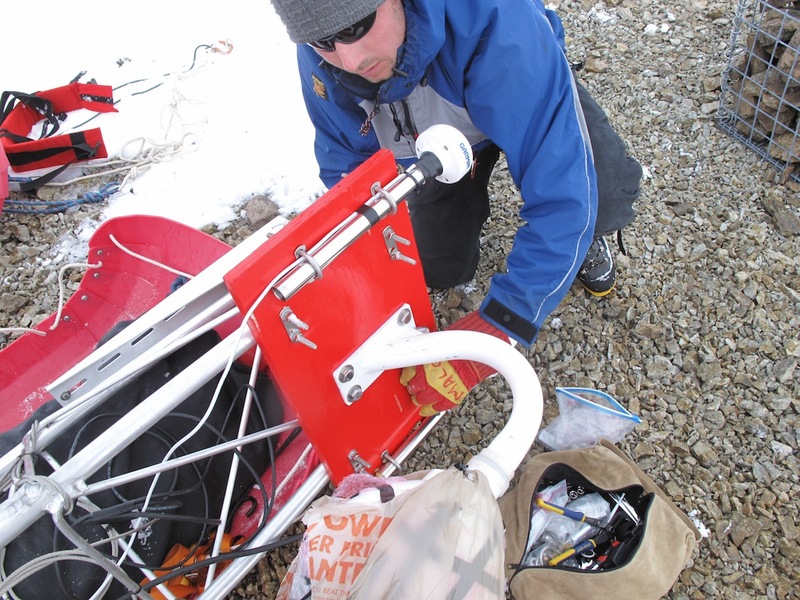 The idea was that the second flight, carrying the science equipment for a GPS installation, would follow immediately. 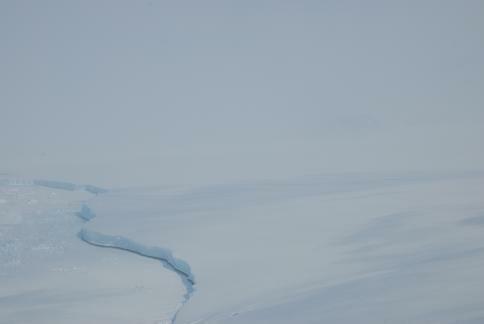 But when we arrived, a low fog was rolling up the glacier from the coast. Like a gray carpet being rolled out, lumps of cloud bumbled in, inexorably covering our site and pushing up-glacier. 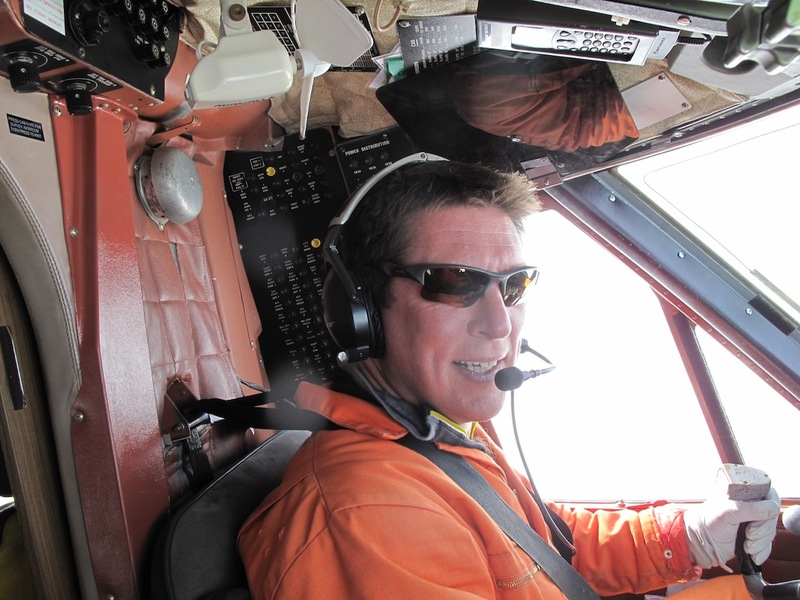 The pilot landed us as close as he could, with the thought that we could report the weather first-hand the next morning and get an early flight. Since then, the fog has been relentless, bringing a listless snow and a total grey-out. 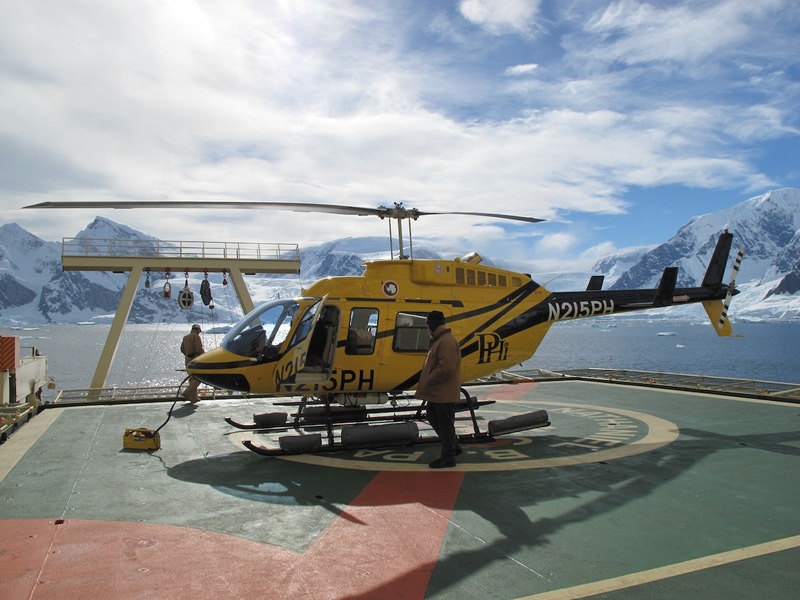 In the thirty minutes after we landed, we reveled in the spectacular scenery of the site near the uppermost end of the glacier. That seems like a distant memory now. 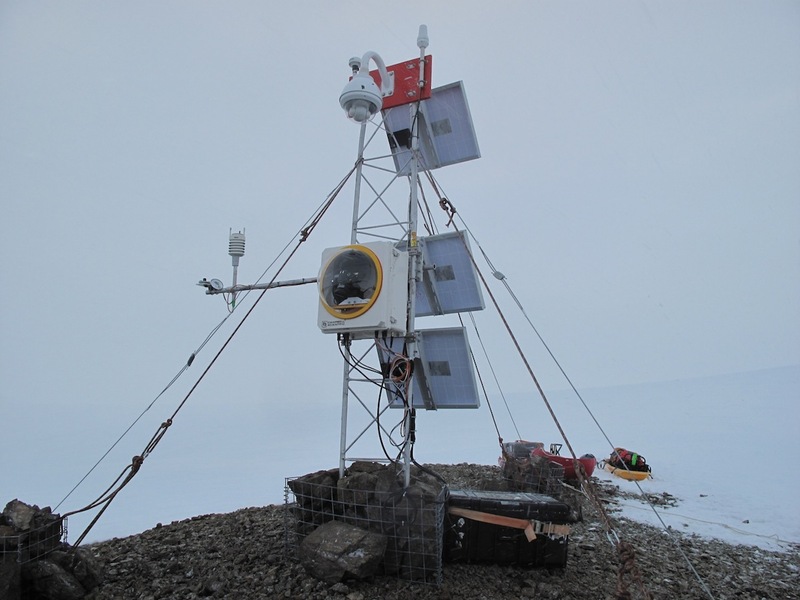 Our world is 200 yards across, extending just beyond our camp boxes at one end, and the radio wires at the other. As for the scenery, we could be anywhere on Earth–anywhere with deep snow on the ground. We’ve seen the sun just a few times, as a glowing pale ball behind thick clouds. Worse yet, the radar system, the one bit of science gear we fit in on the first flight, the one that performed so well at Site Beta, is having problems. 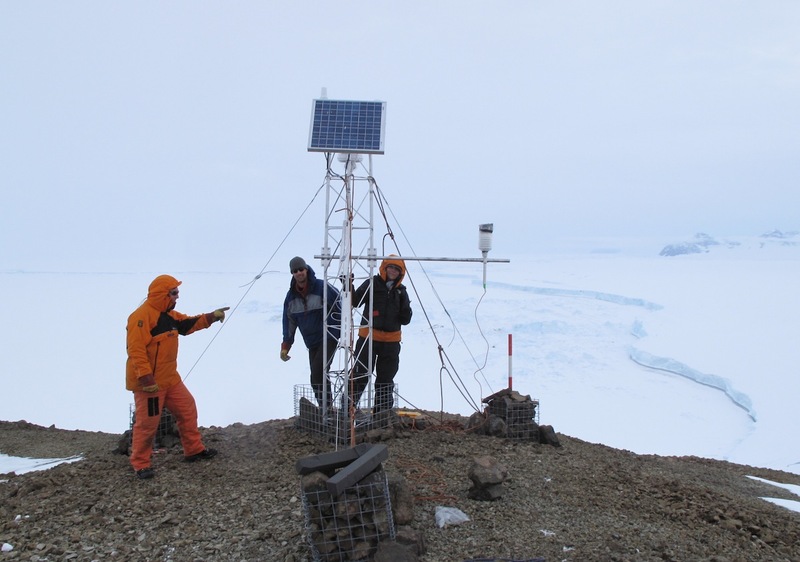 We’ve done a couple of surveys, but can’t measure the depth of the ice here just yet. We’re truly living through the movie “Ground-Hog Day.” Every day is the same, but we keep trying small adjustments to make it a tiny bit better. Then we wake up the next morning, and it starts all over again. Our food has been pretty good. Last night we had Thai red curry on tuna with brown rice, tonight red beans and rice with some canned stew, but the gloom of doing next to nothing for four days is starting to eat away at our optimism, and we have a lot left to do. We’re now so well-prepared that we could do it in record time, but we still need some kind of break in this weather. On the radio, we hear that the ship is also struggling with ice and low clouds. 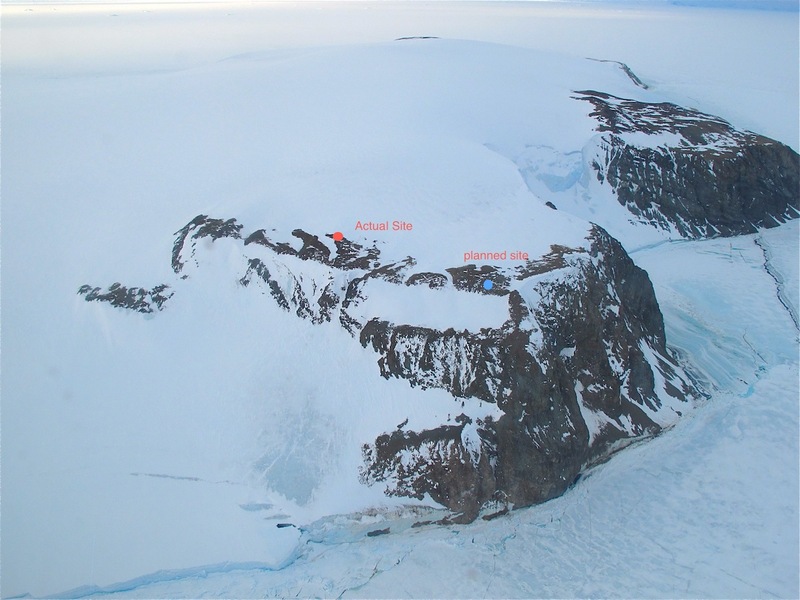 As for Ronald and Terry, the rest of our team, well, they are just whooping it up in Rothera, I suppose, partying their brains out, feasting on cooked food, and showering at will (the nerve). They’re probably even eating fresh fruit. 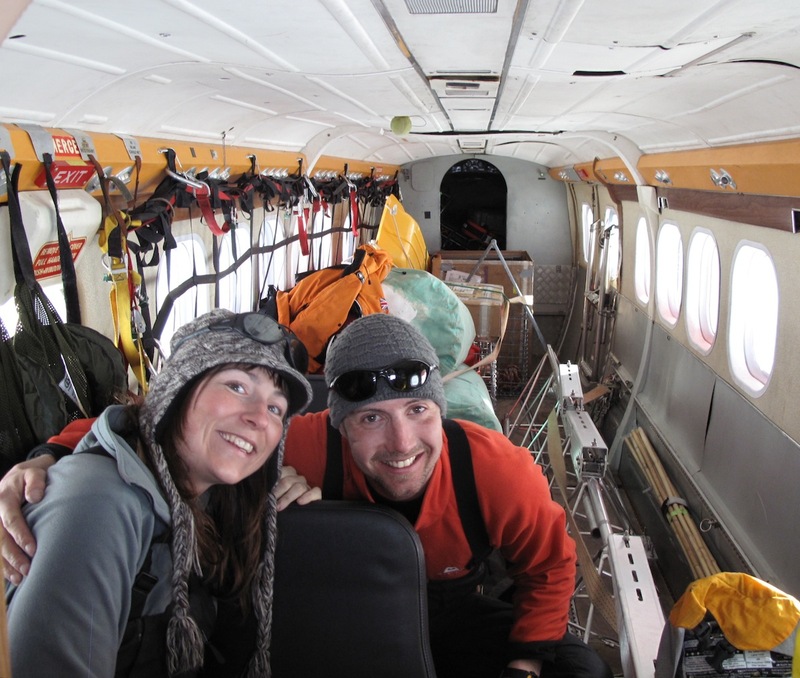 From left: Martin Truffer, Erin Pettit, and Ted Scambos kill time in the tent while waiting for a break in the weather. Ted writes: The N.B. 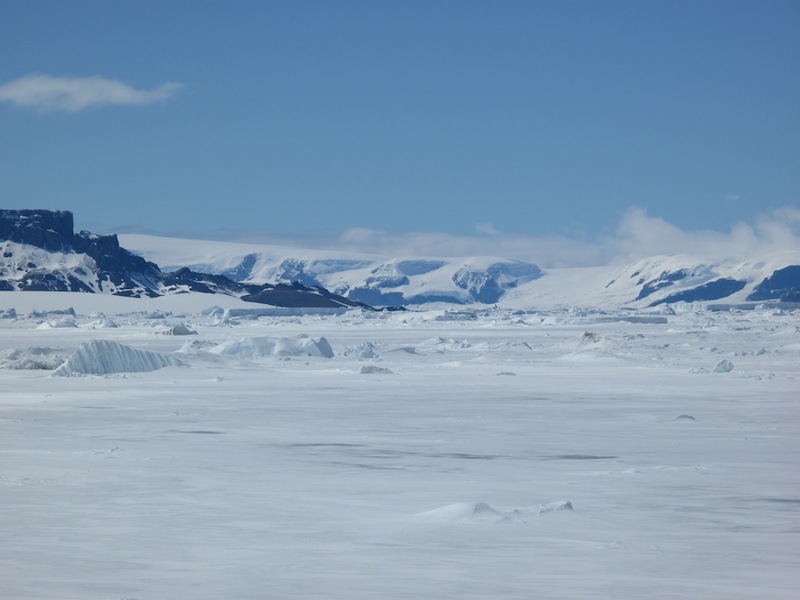 Palmer now sits off the west coast of the Antarctic Peninsula. 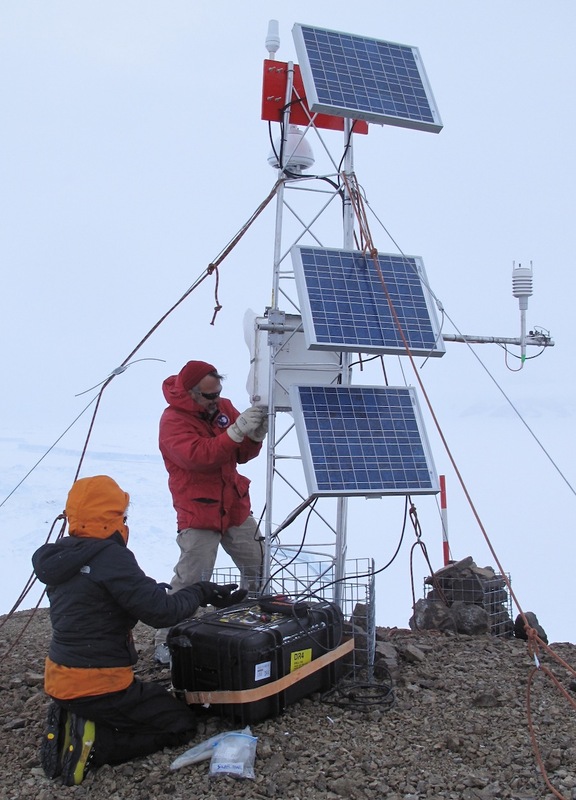 We are waiting for clear conditions to install the AMIGOS stations and other instruments. Most of the time the landscape invisible with drizzle, snow flurries, and fog. It’s quite amazing when the fog lifts momentarily to reveal an astoundingly stark and majestic setting. We are typically cruising in fjords with 1000-foot cliffs, ridges, and glaciers surrounding us. Almost as soon as we arrived, we saw the closest thing to a break in the clouds. Marin and Erin set up a flight to recon the AMIGOS and UNAVCO GPS sites, and from this side it looked like a “go.” As we watched from below, the helo took off, heading for the glacier pass to the eastern side of the peninsula, and then slowed,hovered, and moved in sequence to each of the valleys, peering at the ridge crest. Within 20 minutes they were back. The entire eastern side was clouded, with no breaks at all. 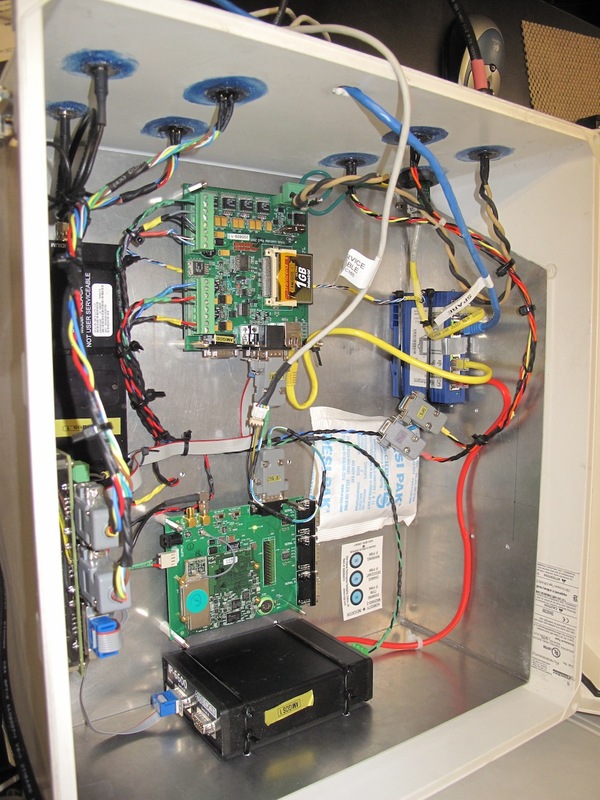 We are continuing to improve the software and integrate the newest sensor on the AMIGOS, a precision GPS sensor (centimeter to millimeter level positioning) incorporated into a single electronic board (built by TopCon, Inc., a new system called GRS-1). Ronald and Terry have most of the AMIGOS brains–the white boxes that contain their electronics–out in the workspace on the first deck of the ship. Ronald and Terry are re-writing the code that they will run when we install them to maximize data collection and power/upload efficiency. We await clear weather…in one of the cloudiest places on Earth. 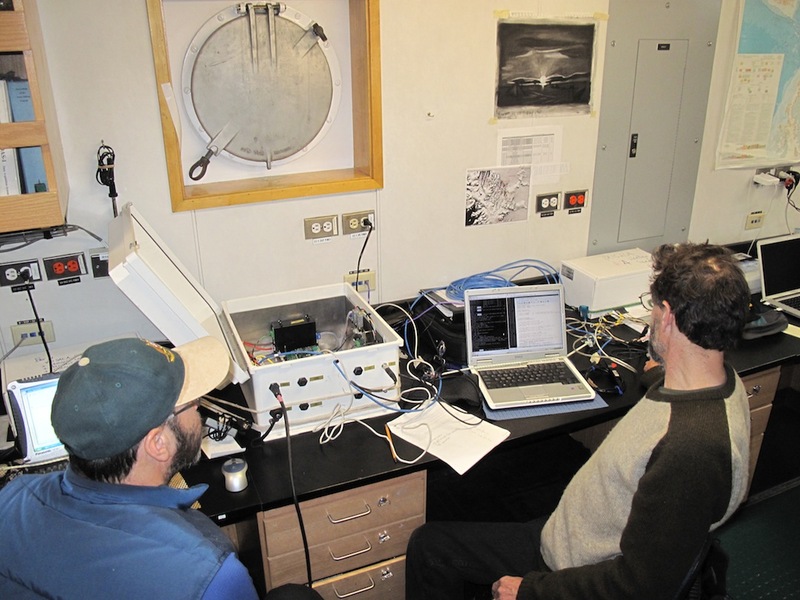 Terry and Ronald work on the AMIGOS station components. The helicopter prepares to take off during a rare clearing. The “brains” of an AMIGOS station.